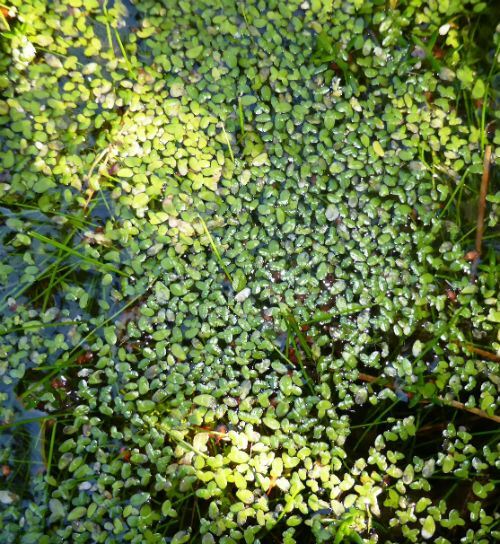 Lemna minor, Duckweed, is a floating aquatic that forms dense, bright green mats. Plants have one, two or three leaves with a root hanging in the water. Leaves are oval and up to eight millimetres long. They have small air spaces to aid buoyancy. Reproduction is mainly by division. The roots are sticky and this enables them to adhere to the plumage and feet of birds. This is a very efficient means of dispersal. We have duckweed covering some of our ponds. We never introduced plants so they probably arrived via avian visitors. Poultry and fish are partial to Duckweed. One of the obscure occupations in Victorian London was duckweed collection. Lemna was collected with a net, bagged and sold to residents as food for their ducks. Lemna was in the Lemnaceae family. The genus is now considered to be in the Araceae family. Lemna minor is self propagating. Once in a pond it tends to cover the surface.